This is a hard review to write, because I don’t want to spoil the movie, but then on the other hand I need to be give you a clue of what kind of a film it will be so you can make an informed decision about whether or not to watch it. I guess I will just say that I really liked the opening and the middle, but the ending did not work for me AT ALL. So if you are able to enjoy a movie in pieces, can separate out sections, you will enjoy it a lot. But if you can’t block out bits and pieces, (like me), then the bitter ugly bit is going to end up ruining the rest of it. So, BE AWARE! This is mostly a delightful happy love story, with good performances and chemistry between the leads. Sara has a magnificent debut. She isn’t as good as she could be, but she is so much better than most actresses in their first movie that I can only imagine how high she can go in her later films. Most of all, she is indelibly herself. Her grandmother’s nose, her mother’s face, but her own confidence and spirit (okay, that’s a little her grandmother and her mothers too, but mostly her own). After all these interchangeable young actresses, it is delightful to see someone with her own personality and look, right in her very first film. She carries the movie, both her performance and the character they wrote for her, something very different. Until the end, when they beat her up and cut off her strength and shove her back in a box. But, like I said, if you can manage to forget the end, her character is distinctive and original and strong. Sushant is Sushant, charming smile, good at ducking his head and seeming shy, really good in his one big dance scene. A lovely scene partner for Sara, but it’s really her story and her film. His character is nothing terribly original, while hers really is. The directing is spectacular, very interesting visuals, little things like focusing on Sushant’s feet as he lopes along the path and then panning to another pair of feet before pulling up to reveal who they belong to. The location looks beautiful, the mountain paths and gorges and even the quality of the light is perfect. And it all comes together to give us this feeling of a valley connected by winding paths and loyal porters, centered on the temple. The romance is a classic old-school romance. A love at first sight moment, and then a slow magical build as they fall more deeply in love without admitting it to each other, building to the “I am so in love I am going to DIE!” experience. And in this very short film (less than two hours) the romance is given plenty of time to breath and grow. That part of the film is pretty much perfection. Where the film stumbles is in the bigger message. Thanks to either self-censorship or real censorship, the clear argument for a unifed secular India that the film builds is kind of cut off halfway. Weird censorship story, by the way. Part of the weirdness being that it wasn’t covered very well or very in depth so I am having a hard time following it. Starting at the end, the stupid humiliating-for-India-as-a-country law suit against it in the Bombay High Court because it encourages “Love Jihad” was defended not just by the production house, but by a representative from the Censor Board!!!! Who argued that it was the responsibility of the Censor Board to decide what should be in movies and they had passed this film and therefore this suit had no basis. I saw at least one story about another judge in another one of the suits who not only dismissed the lower-than-insect-life fake Hindu group’s lawsuit as frivolous, but quizzed them on Hindu scriptures and proved they have no right to speak for that religion. But then, on the other hand, it was in fact band in Uttarakhand. The argument against the movie is that it promotes love and understanding. Which, as we all know, are the enemies of modern India. The “Love Jihad” they are referring to is the idea that Muslim men are seducing and tricking Hindu women away from the Hindu community. This is, of course, a fantasy. But it is used to justify the usual horrific violence you would expect. Young people being torn from each others’ arms and killed by their families. In this case, the woman being “saved” from life as a wife of a Muslim man by her father either arranging her forced marriage, or her murder. And then the man (and sometimes his family, friends, and neighbors) being killed by an angry mob. For the good of India. A movie like this, in which a Muslim man and Hindu girl fall in love, is a clear enemy of Indian culture, tradition, and so on and so forth. And the filmmakers, and the censor board, KNEW they would be treading on thin ice. The message of the film is love, not just between these two characters, but between a whole community that existed for generations in harmony. Until the past 30 years (thank you BJP!) when suddenly it doesn’t. If this film were living it’s best version of itself, the love between the central couple would spread out and win over everyone. But the filmmakers couldn’t tell that story. They started to head in that direction and they had all the pieces to make it work, but they were afraid and they were practical and knew that particular story would never make money, or even be allowed to play, in New India. And so the political message, the larger story of the community, suddenly disappears without a conclusion 2/3rds through. It’s the biggest flaw of the film, leaves so many plot threads dangling and ideas not quite finished. But the rest of it is quite good! The songs are delightful, the romance is perfect, even the action sequence at the end is clear and affecting. I would 100% recommend it. If it weren’t for that last quarter. Oh well. This entry was posted in Uncategorized and tagged Kedarnath, Review, Sara Ali Khan, Sushant Singh Rajput by mredlich21. Bookmark the permalink. In your opinion who has had the best debuts? In terms of talent, not the overall success of the movie. Oh and not necessarily from the past one or two years, could be anytime. But off the top of your head who comes to mind? I think Anushka Sharma wasn’t bad. Of course Rani and Kajol and Preity have always been pretty good to me. Oooo, good question! Dips and Anushka both had good debuts. Preity too. Kajol’s was terrible (I’ve actually watched it years ago, horrible movie). Rani maybe was the best? The one-two of Ghulam and K2H2 really put her on the map without putting a lot of pressure on her. In terms of jawdropping “wow, who is this actress?”, maybe Kareena? Refugee was such a great debut for her, she was immediately riveting. Oh, and Juhi of course!!!!! And Madhuri would be the best of all if we count Tezaab and not that other Rajshri movie. Hahaha I actually haven’t seen Kajol’s debut. I just assumed it was good based on her other films hahaha. I actually haven’t seen Refugee! But in 2007 I actually thought Sonam had the better debut. Her character was confusing and weird but I felt she managed to pull off the essence of it. I felt Deepika was really over rated, especially when she was nominated for a best actress. She wasn’t bad but I found her kind of stuff and felt like she was acting. But she’s much much better than Sonam now. She seemed to care a lot about improving her acting and growing, more than Sonam I think. But I still feel Deepika’s acting skills are overrated sometimes. She was really good in Piku, she suits those roles. She wasn’t bad in Tamasha. But I didn’t like her that much in Padmavati. I thought Anushka was actually really good in BBB. Oh back to debuts Kangana too I think, and Priyanka was also pretty good. Rani was so good in KKHH, esp the scene where shah Rukh was laughing at Kajol’s makeup and later comforts her, her mixed expression of finding it sweet that he was comforting her but also feeling awkward and trying to leave was so natural. I wish she and SRK would act in a mature romance soon, like the mistletoe one! Oh yeah, Sonam had a great debut! Good role and made her look special and different from the other actresses. Anushka was really good in BBB, if that had been her debut she definitely would have been my choice. Priyanka was decent in Hero but didn’t blow me away. Kajol’s debut was some small movie with another debut actor whose career went nowhere. It was Not Good. I know a couple of muslim girls who married Hindu guys but don’t know any Hindu girl that married a muslim guy (Kareena Kapoor or Gauri Khan don’t count!!). 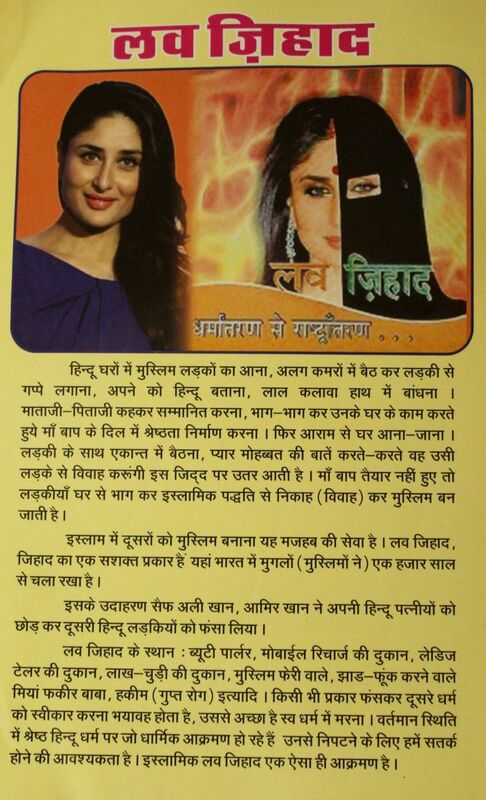 I don’t understand where this Love Jihad thing is coming from. However it was a point of discussion among our classmates that if we ever fall for a muslim guy, we’ll have a court wedding first and then go for nikha. It is commonly assumed that nikha offers less protection than a Hindu or a court wedding!! Weird thing to discuss but we did talk about it. My friend from Chennai had a huge problem with Kamal’s Dasavataram because of the the reason Tsunami. I hope it is dealt with more sensitivity here. BTW Congress was in government when it happened so you can’t blame BJP government for the intolerance. Yeah, the way they handled the floods was kind of on the edge of okay. Like, just barely. They do convey the sudden horror of it happening, and the way the community was just swept away. And they avoid arguing any larger reason for it, that it was the failed love story or lack of faith or anything like that. It’s still turning a real life tragedy into an exciting action sequence, but just barely. And they end with a lot of information and footage of the real event. The songs are really good. I feel like it’s been different Kedarnath songs the past few times I’ve clicked over to see what that new song is when I’m streaming at work and something catches my ear.